A recording of the 4th movement of Dvorak's Symphony No. 9 from 1957 at Strong Vincent Auditorium under the direction of James Sample. A recording of the 2nd movement of Dvorak's Symphony No. 9 from 1957 at Strong Vincent Auditorium under the direction of James Sample. A recording of the 3rd movement of Dvorak's Symphony No. 9 from 1957 at Strong Vincent Auditorium under the direction of James Sample. A recording of the 1st movement of Dvorak's Symphony No. 9 from 1957 at Strong Vincent Auditorium under the direction of James Sample. Wow. Since starting here in late January, I have enjoyed every moment of working with the Philharmonic. The only word to describe the experience is ‘wow’. I began right before the Scheherazade concert with soloist, Sharon Isbin. Being involved in the week preparations was exciting, but only met by the outstanding performance on Saturday night. After my first week, I was blown away by the coordination and commitment the staff has to each and every event. Moving through more concerts, a gala, and closing the season; another event that ensured my connection to the Erie Phil was working with the YMCA on Healthy Kids Day. The administrative staff spent the afternoon welcoming kids to play cardio drumming and with boom whackers. I never knew what either of these activities were, but after that day, I would self-identify as a professional cardio drumming connoisseur. Absolutely joking, I cannot keep any rhythm! But the beautiful thing about spending this time together, was that I truly felt the connection with the children that came to play. I had such an unforgettable time meeting new people—parents and kids alike. The smiles of the kids will be engraved in my memory moving forward with continued Erie Phil outreach events. While continuously working throughout the week with subscribers, donors, musicians, and more, I knew I found the place I wanted to be working. The staff is consistently trying to challenge themselves to create better experiences for the Erie community, a value I hold close to my heart. I have thrived on every moment I have had with the Erie Philharmonic so far and cannot wait to explore new challenges and adventures in future seasons! A recording of Beethoven's Symphony No. 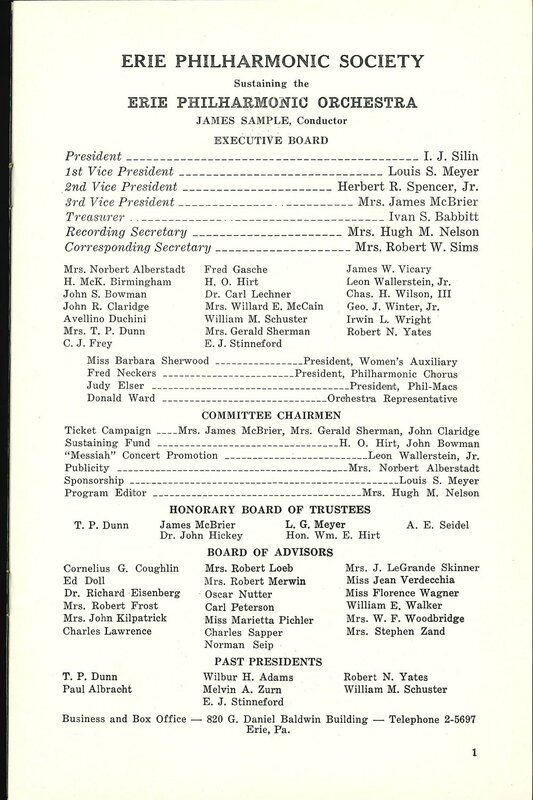 7 from April 1958 at Memorial Auditorium under the direction of James Sample. Don't miss additional Beethoven selections this coming year as part of our Beethoven 4/4 Festival! 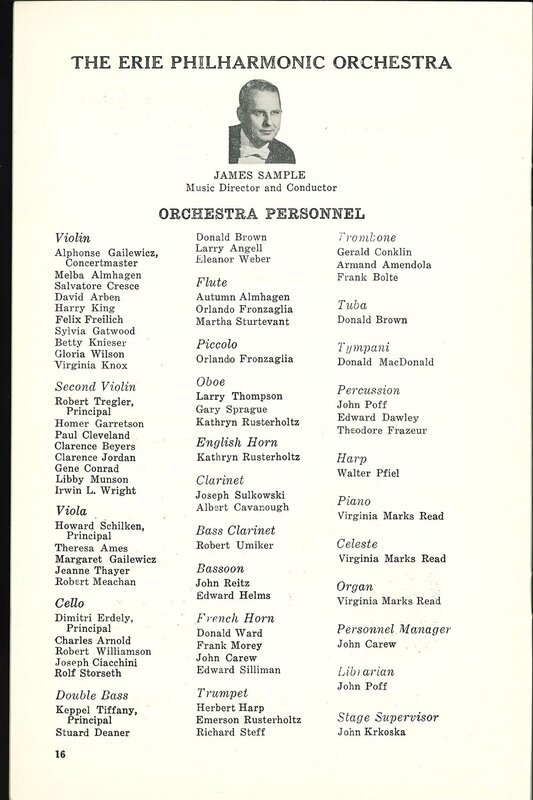 A recording of Wagner's Overture to Tannhauser from April 1958 at Strong Vincent Auditorium under the direction of James Sample. 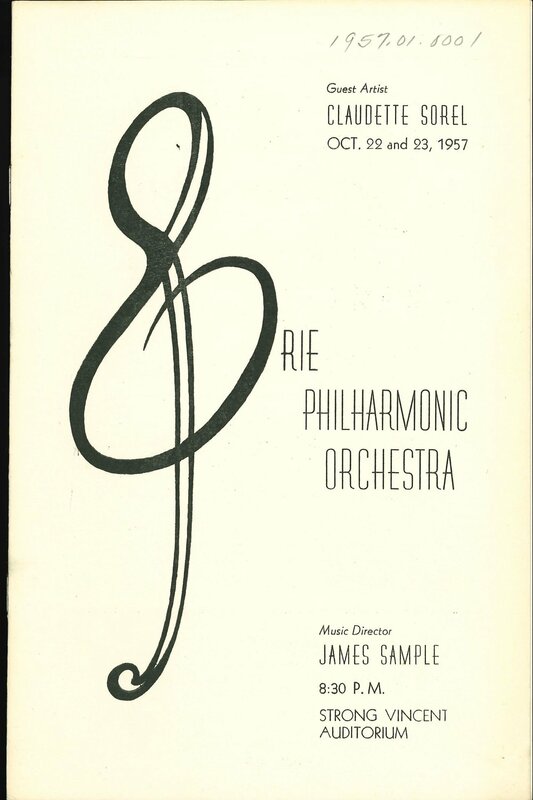 A recording of Copland's Fanfare for the Common Man from October 1960 at Memorial Auditorium (now Erie High School) under the direction of James Sample. Don't miss this iconic piece performed this season as part of Copland's majestic Symphony No. 3. The Erie Philharmonic was part of a consortium of orchestras that commissioned the legendary composer Philip Glass to write a new piano concerto for pianist Simone Dinnerstein. Watch this amazing new work come together in the above video, and be sure to not miss the regional premiere on April 7 right here on stage at the Warner Theatre! Concert preview from Music Director Daniel Meyer for our season finale concert coming up on April 7. I suppose the finale concert of any concert season is filled with nostalgia to some degree. It is a chance for the Philharmonic to look back on a season filled with highlights, musical triumphs, and happy collaborations. We can also take stock of how far we have come as an ensemble – how well we make music together, how vividly we realize the intentions and dreams of our composers, and how deeply those impressions have been printed on the hearts and souls of you, our beloved audience. We can also look forward to a future of making-music together that will continue to increase in quality and richness, also thanks in large part to your enthusiasm for how we play on the Warner stage and throughout our region. In some ways, the musical selections that make up our season finale program reflect those backwards and forwards glances. The Bach keyboard concerto Simone Dinnerstein will play certainly takes us back to a time of the clean, lean musical textures of the Baroque-era concerto. We revere Bach for his musical intelligence, but we respond to Bach for the coursing energy that runs through his counterpoint and dance rhythms. Prokofiev’s Classical Symphony seeks to capitalize on looking backwards towards the greats who have gone before (namely Haydn) in a sprightly mini symphony. While dabbling in nostalgia, he also points forwards with thoroughly modern, sometimes unexpected and sudden harmonic changes. Ravel fondly looks way back, to Greek antiquity, in choosing to set Longus’ Daphnis and Chloe in a full-length ballet. But he also clearly bathes in sumptuous, unabashedly sensual orchestral colors and rich harmonies that could not have even been imagined before. This music delights in the interplay between sonic saturation and stark, spare moments. I suppose that is one of the reasons why this work is so effective on the concert stage, apart from any dancing, costumes, or sets. Even the brand-new piece that we helped commission, Phillip Glass’ Third Piano Concerto, pays a debt to Bach in its use of a Baroque-era orchestra (strings only) and Bach-ian counterpoint. Glass’ modern twist, of course, is how his repetitions and slight modifications to texture and musical notes creates a slow evolution and an emotional state not unfamiliar to Indian music lovers. So let’s look and listen forwards and backwards together next weekend. Let’s delight in how composers respect and even subsume elements of the creators who lived long before, yet also delight in the departures they take from those influences. Together let us celebrate the finale of the 17-18 Erie Philharmonic Symphonic Season, and also look forward to another nostalgic and forward-looking 18-19 Season with a sense of discovery and delight! The Best of all Possible Worlds! I have to admit, when I was asked to be a part of Candide…I didn’t know much about it other than the song “Glitter and Be Gay” which I would be lucky enough to be singing. After further research and a full listen to the cast recording, I immediately fell in love. This show is special to me for so many reasons. Not only is it an incredible piece of comedic theatre, based off a brilliant novella by none other than Voltaire, but this will be the first time I’ve performed a show in Erie, PA since I was 18 years old where I played Maria in West Side Story at the Erie Playhouse. Not to mention that I’m going to be starring opposite my best friend and the most talented lady I know, my mom. I’m so lucky to have grown up in the Erie community where theatre is so appreciated and encouraged. I’m even MORE lucky to have grown up in a household where music and theatre were constantly celebrated. Cast albums were always playing through the speakers and we were always working on our next musical project. The last show my mom, Trisha, and I did was Into The Woods by Stephen Sondheim where she played the Witch and I played her daughter, Rapunzel conducted by none other than our main man, my dad, Bruce Yates. Fast forward 15 years later, where we will be standing together once again where we both belong, on the stage. I’ve spent the years since then going to school for Music Theatre, moving to NYC, working crazy hours and attending endless auditions until one day I landed a gig that changed my life: cruise ships. I’ve been fortunate to travel the world performing, however this time it was someone else extremely special. That someone is actually who I’ll be starring opposite in this show! My best friend, Michael Valentine. How often do you get to get paid to travel the world and perform with your best friend?!? Not often! Michael and I met 13 years ago doing AIDA at the Erie Playhouse. He was this new boy from Philadelphia that was coming to play Radames, so we were all very eager to meet this mystery man. I’ll never forget the day he walked in (May 2nd, 2005 — I have a journal entry from that exact day) and the rest is history. We became extremely fast friends, and considering he was “new” to Erie, I decided it was my duty to take him under my wing (whether he particularly wanted that or not!). After a few shows together, life took us in different directions for a while, but then we came back together and moved to NYC in 2010. Since then, we’ve stumbled through life together dreaming of the day we could actually do a show together again (and not just production shows like on the cruise ships). Well, thanks to the Erie Playhouse, The Warner Theatre and the Erie Philharmonic - that time has finally come! Our dreams are coming true! I can’t wait to be back on my old stomping grounds with so many of my dear, old friends to bring this art to life! I can truly say, that everything is for the best in THIS best of all possible worlds. Sometimes the idea for a new concert comes out of the most casual of conversations. I remember finding that I had been sent a recording of the Highlander soundtrack the same day that it was announced that Game of Thrones was about to film its final season. That got me to think about all the great film and television scores that have come out of the realm of fantasy over the years. I started the conversation with Alex Hake, our former Operations Manager, and Steve Weiser, our Executive Director about possible scores we could perform as part of a Pops concert with the Erie Philharmonic. Both reminded me about the wealth of music that had been scored for video games, which was a revelation to me. Of course I knew that the game companies took their musical scores seriously, but I had to admit that I did not have any familiarity with specific games and their music. What a treasure trove of fun, Wagner, Orff, and Shostakovich-inspired music lies ‘buried’ in those video game soundtracks! It turned out to be relatively easy to start identifying what we thought were our favorite scores, from Harry Potter to Lord of the Rings to Skyrim – the challenge was to decide what NOT to include in this concert. I wanted to make sure that we included at least some of the classical composers who influenced these modern-day masters like John Williams and Howard Shore. You will hear music of Carl Orff from his famous ‘Carmina Burana’ as well as music by the famous German Romantic composer Richard Wagner in his ‘Lohengrin.’ Both composers had a talent for transporting you to a land long ago in a place far away though their vivid and epic musical creations. I wanted to place those classic composers alongside the soundtracks of today to show how similar the techniques and gestures of those artists were to the utterances of today - a great, sweeping score was as effective in a 19th-century Dresden Opera House as it is today in a movie theatre or home entertainment system in Erie, Pennsylvania! As this concert is already sold-out, I am continually amazed with how music from these films, television series, and video games have made such a lasting impact on our culture. In the end, the stories of romance, chivalry, conquest, and heroism are transposed anew in each era, but in the realm of fantasy, our imaginations and ability to suspend disbelief can take us to places we never thought possible and discover things about our own human nature that bring us to unending discovery. See you Saturday at the Warner! Sergei Prokofiev was born in Sontsovka, Russia, on April 23, 1891, and died in Moscow, Russia, on March 5, 1953. The first performance of the “Classical” Symphony took place in Petrograd (St. Petersburg), Russia, on April 21, 1918, with the composer conducting. Approximate performance time is fifteen minutes. Sergei Prokofiev composed his “Classical” Symphony, one of the most popular concert works of the 20th century, during a period that spanned the years 1916-1917. He completed the orchestration on September 10, 1917. The world premiere of Prokofiev’s “Classical” Symphony took place in Petrograd on April 21, 1918. The composer led the former St. Petersburg Court Orchestra. Despite the turbulence that plagued Russia during the composition of the “Classical” Symphony, the work represents Prokofiev at his wittiest and most carefree. Perhaps that is not surprising, given the “Classical” Symphony is Prokofiev’s tribute to the greatest of symphonic humorists—the 18th-century Austrian composer, Franz Joseph Haydn (1732-1809). It seemed to me that had Haydn lived to our day he would have retained his own style while accepting something of the new at the same time. That was the kind of symphony I wanted to write: a symphony in the classical style. And when I saw that my idea was beginning to work, I called it the Classical Symphony: in the first place because that was simpler, and secondly for the fun of it, to “tease the geese,” and in the secret hope that I would prove to be right if the symphony really did turn out to be a piece of classical music. The “Classical” Symphony is in four brief movements. The first is a bracing Allegro. Prokofiev directs that the central theme of the slow-tempo second movement (Larghetto) be played molto dolce (“very sweetly”). The third movement is a Gavotte, a court dance in 4/4 time. The Finale (Molto vivace) brings the “Classical” Symphony to a joyful close. Johann Sebastian Bach was born in Eisenach, Germany, on March 21, 1685, and died in Leipzig, Germany, on July 28, 1750. Approximate performance time is fourteen minutes. The G-minor Harpsichord Concerto is one of several such works Johann Sebastian Bach compiled, circa 1738. Each is a transcription of an earlier concerto for “melody” instrument and orchestra. The Concerto in G minor is derived from the composer’s Violin Concerto No. 1 in A minor, BWV 1041, composed during Bach’s years of service to Prince Leopold in Cöthen (1717-23). Scholarship indicates that Bach composed the Harpsichord Concertos for performance by the Leipzig Collegium Musicum. Originally founded by Georg Philipp Telemann, the Collegium Musicum was a group of Leipzig students and citizens who performed concerts within the city on a regular basis. It is quite possible that Bach, one of the finest keyboard artists of his day, appeared as soloist in the Collegium Musicum performances of his Harpsichord Concertos. The Concerto is in the standard three movements. The first contains no specific tempo designation, but is clearly meant to be played briskly. The central slow-tempo movement (Andante) highlights the soloist’s flowing melodic line. The finale (Allegro assai) is a vigorous dance in triple meter. “Several years ago, Simone Dinnerstein visited me at my home in New York City and played a short program of Schubert and Glass. She played with a complete mastery of technique, depth of emotion, and understanding. Right away I knew I would someday compose music for her. The idea for Philip Glass’s Third Piano Concerto came after that fateful meeting between pianist Dinnerstein and Philip Glass at the composer’s home on the Lower East Side of Manhattan in September 2014. The following spring, on March 27, Dinnerstein had her first interaction with A Far Cry and immediately found a special artistic spark with the orchestra. Glass was aware of Dinnerstein’s interpretations of Bach on recording and had the occasion to hear Dinnerstein play privately at his home the music of Schubert as well as Glass, but the occasion to hear her perform live didn’t come until the end of 2016 when the composer was awarded the Eleventh Glenn Gould Prize in Ottawa. At the premiere performances Dinnerstein performed with A Far Cry without a conductor. When asked about performing the new piece with a conductor the pianist was thrilled with the idea: that each orchestra and conductor would bring their own ideas to the piece. And the experience of performing the piece with a conductor like Daniel Meyer brings a totally new interpretation. This evening's performance represents the Pennsylvania premiere not far away from where Glass spent a number of years as a composer-in-residence in the Pittsburgh Public School system in the early 60s after obtaining his Masters degree at Juilliard. All this contributed to a concerto which is unlike any other that Glass has composed. Philip Glass has always been a composer whose music drives forward very rarely looking backwards. However recently, his works have taken on a new dimension of a kind of rare beauty and acceptance. These are pieces which have nothing to prove rather they seem to ruminate, to look into the language of music itself, finding a new kind of old beauty. - Richard Guérin, 27 February 2018, Salem, Mass. Maurice Ravel was born in Ciboure, Basses-Pyrénées, France, on March 7, 1875, and died in Paris, France, on December 28, 1937. The first performance of Daphnis et Chloé took place at the Théâtre du Châtelet in Paris on June 8, 1912, with Pierre Monteux conducting the Ballets Russes. Approximate performance time is thirty minutes. In the summer of 1909, Sergey Diaghilev’s Ballets Russes burst upon the Paris artistic scene. Diaghilev’s brilliant and controversial productions inspired audience and critical reaction that ranged from adulation to violent rebellion. During his early years in Paris, Diaghilev made the acquaintance of several young composers with whom he collaborated on some of his company’s greatest triumphs. For example, a meeting with the young Igor Stravinsky led to such works as The Firebird (1910), Pétrouchka (1911), and The Rite of Spring (1913). Around that same time, Diaghilev met French composer Maurice Ravel. It was not long before Diaghilev, greatly impressed by Ravel’s talent and affinity for the theater, commissioned a ballet based upon the story of Daphnis and Chloe, a pastoral romance attributed to the fourth century Greek sophist, Longus. Choreographer Michel Fokine adapted the story for Ravel’s composition. The first performance of Daphnis et Chloé took place at the Paris Théâtre du Châtelet on June 8, 1912. Despite the incredible assemblage of talent (including Vaslav Nijinsky and Tamara Karsavina in the title roles, conductor Pierre Monteux, choreographer Michel Fokine, and designer Léon Bakst), the absence both of sufficient rehearsal time and unanimity of artistic vision resulted in a rather lackluster premiere. In truth, full productions of Daphnis on the ballet stage are a rarity. The work requires the talents of a virtuoso orchestra and (wordless) chorus that most ballet companies are hard-pressed to assemble. On the other hand, the score Ravel termed “a choreographic symphony in three movements” has enjoyed tremendous success in the concert hall. The orchestral Suites Ravel fashioned from the complete work are staples of the concert repertoire—particularly the Suite No. 2, containing the majestic Sunrise and thrilling Danse générale from the ballet’s Third Part. The shepherd, Daphnis, and Chloe are in love. Chloe is captured by pirates. As the First Suite opens, Daphnis, in despair, has a dream in which he encounters the god Pan (Nocturne). The scene changes to the pirate camp (Interlude). Chloe, now a prisoner, is forced to dance for her captors. Suddenly, Pan appears as a fearsome image, causing everyone to flee (Dance of the Warriors). The Second Suite corresponds to the action of the ballet’s Third Part. After the majestic Lever du jour (Sunrise) Daphnis and Chloe are reunited. The two mime the tale of Pan and Syrinx (Pantomime). Daphnis pledges himself to Chloe, and the ballet concludes with a thrilling, joyous dance (Danse générale). Beethoven. He doesn’t even need a first or middle name. The name evokes majesty, brilliance, excellence, struggle, triumph, greatness. Alongside Mozart and Bach, Beethoven probably looms largest across the planet in sheer number of marble (and faux-marble) busts that exist of the man. His status as one of the greatest composers who ever lived on planet earth is most assuredly fixed, and it’s a wonder that re-creative artists like myself, Alec Chien, the voices of the Erie Philharmonic Chorus and the musicians of the Erie Philharmonic even dare to perform his music. History has constructed a pantheon around Beethoven, for better or for worse, and it sometimes seems like sheer folly to think that we can come close to realizing what this genius intended to revel in his notes and rests. But among all the marble, there is something much more tangible about Beethoven’s music. Despite the brilliance and other-worldliness that certainly characterizes much of the intention behind his music, there is an earthiness and a real, imperfect human struggle imbued in the textures, phrases, rhythms, and melodies of his music. Beethoven was a man, writing for other women and men. He knew we would struggle to come to grips with what he wanted, but that was all part of the bargain. In exchange for the opportunity to peer into the mind and soul of this man, we must offer our best. Not satisfied to simply render the notes and rhythms in the right place at the right time, our quest must ever be to reach to touch the divine spark that inspires a man who suffered so much, yet offered such opportunity for joy. Our two works this weekend wonderfully encapsulate what Beethoven was about – an earthbound genius working his hardest to deliver music that embraces the community but celebrates the individual. The Fourth Piano Concerto is one of the most beautiful examples of the wit, fancy, imagination, and technical brilliance that converges in one piece to challenge the solo pianist-hero, speaking the language of the composer-hero, making music among the auditor-participants (the orchestra) in service to the listening public. The Choral Fantasy, takes this one step further in introducing text, operatic soloists, and a full chorus to this interplay of orchestra and pianist. The words Beethoven sets are aspirational, and they serve as a torch pointing towards what he would ultimately achieve in his setting of Schiller’s Ode in the finale of his Ninth Symphony. Heady, for sure, but ultimately thoroughly captivating as a piece of music as well as a philosophical statement. Bernstein was our own American Beethoven. Another genius of staggering proportions, Bernstein was able to immediately absorb, comprehend, and then relay the great utterances of the marble composers (what a pianist, what a conductor! ), but was also bold enough to try his own hand at creative expression. From theatre masterworks like West Side Story and Candide to film scores like On the Waterfront, Bernstein strove to find a large audience, beyond the walls of the classical concert hall. Yet Bernstein also existed in those hallowed halls as a brilliant interpreter/conductor/pianist. He embraced his classical training and was rightly counted among the finest performers in that realm in the twentieth century. The work we will perform this weekend, Chichester Psalms, perfectly represents an artist fusing popular idioms. Bernstein’s pop-style melodic gift (not unlike Gershwin’s), his own Jewish heritage, and his serious, classical bent deeply influenced by his favorite composers like Beethoven and Mahler conspired to make him stand alone atop a musical Olympus where very few should have tread. Yet like Beethoven, Bernstein embraced his imperfections and humanity in a way that endeared himself to his musicians and his public. He was a man of the people, above the people, and we are richer today for his efforts in both the creative and re-creative realms. Our concerts this weekend embrace what both Beethoven and Bernstein meant to us as inspired artists deeply concerned with shaking us, the performers and audience, to the core of our existence. Live interview with conductor George Daugherty from our Bugs Bunny at the Symphony II concert! Buy Tickets - only a few left! Ludwig van Beethoven was baptized in Bonn, Germany, on December 17, 1770, and died in Vienna, Austria, on March 26, 1827. The first public performance took place in Vienna at the Theater-an-der-Wien on December 22, 1808, with the composer as soloist. Approximate performance time is thirty-four minutes. Beethoven completed the score of his G-Major Concerto in 1806, and first performed the work during a March 1807 private concert at the palace of his patron, Prince Joseph Lobkowitz. The first public performance of the Fourth Piano Concerto took place at the Vienna Theater-an-der-Wien on December 22, 1808. In addition to the Fourth Piano Concerto, the concert, sponsored by Beethoven, included the world premieres of the composer’s Fifth and Sixth Symphonies and Choral Fantasy, as well as four movements from his Mass in C and the soprano aria, Ah! Perfido. Still, the benefit concert (known as an Akademie) was far from a resounding success. The meager rehearsal time was insufficient for a program of such length and difficulty (see, Choral Fantasy, below). Further, the audience endured this taxing winter program in an unheated theater. The Fourth Piano Concerto proved to be the last such work Beethoven composed for his own performance. Increasing deafness finally made public appearances all but impossible for one of the greatest piano virtuosos of his time. The Beethoven Concerto No. 4 is in three movements. The first (Allegro moderato) is by far the longest. Instead of the traditional purely orchestral introduction, the soloist immediately intones the first principal theme. The brief second movement (Andante con moto) is in the form of a dialogue between the strings and piano. Franz Liszt compared this episode to “Orpheus taming the wild beasts with his music.” The finale (Rondo. Vivace) ensues without pause. Beethoven presents a remarkable variety of moods and instrumental colors throughout. After a cadenza and series of trills, there is a moment of repose before the soloist and orchestra dash headlong to a Presto finish. Leonard Bernstein was born in Lawrence, Massachusetts, on August 25, 1918, and died in New York on October 14, 1990. The first performance of Chichester Psalms took place at Philharmonic Hall (now Avery Fisher Hall) in New York on July 15, 1965, with the composer conducting the New York Philharmonic, the Camerata Singers, and John Bogart, alto. Approximate performance time is nineteen minutes. In 1964, Bernstein received a commission from Dr. Walter Hussey, Dean of the Chichester Cathedral in Sussex, England, to compose a new work for its summer music festival. Bernstein originally intended to call the work Psalms of Youth, but finally decided upon Chichester Psalms, because the piece “is far too difficult.” Bernstein composed his Chichester Psalms in Manhattan during the spring of 1965, completing the work on May 7. The Cathedral graciously allowed Bernstein to conduct the premiere not at Chichester, but at a July 15 New York Philharmonic concert. That performance featured a mixed choir (male and female voices). On July 31, the first performance of the composer’s preferred original version—with a male choir—took place in Chichester. With its tonics and triads and E-flat major. Ludwig Van Beethoven was baptized in Bonn, Germany, on December 17, 1770, and died in Vienna, Austria, on March 26, 1827. The first performance of the Choral Fantasy took place in Vienna at the Theater an der Wien on December 22, 1808, with the composer as conductor and piano soloist. Approximate performance time is eighteen minutes. The world premiere of Beethoven’s Choral Fantasy took place as part of the same December 22, 1808 concert that featured the world premiere of the composer’s Fourth Piano Concerto (see, above), as well as several other masterworks. It appears the quality of the December 22, 1808 performance did not match the lofty inspiration of featured works. Beethoven, never the most technically adept of conductors, was unable to secure sufficient rehearsal time to assure competent performances of the new and difficult music. By all accounts, orchestral execution during the concert was precarious at best. The worst mishap may have occurred during the premiere of the Choral Fantasy. Beethoven composed the work at lightning speed, commencing just a few weeks before the concert, and finishing barely in time for rehearsal. During the performance, the orchestra was forced to stop in the middle of the work, and begin a section over again. Beethoven later apologized to the orchestra, and made a point of publicly assuming the blame for the mishap. Perhaps the Choral Fantasy was ill-fated from the start. It would in time be eclipsed by a related work, but as Beethoven himself noted, one composed “on a far larger scale”, the epic Ninth Symphony (1824). The similarities between the Choral Fantasy and the finale of the Ninth are readily apparent. Both are structured as a series of variations on a theme. In each work, the variations are first presented by the orchestra, then by the chorus. The Ode To Joy is a clear descendent of the principal theme of the Choral Fantasy (actually first used in Beethoven’s 1794/5 song Gegenliebe (Mutual Love), WoO 118). The Christian Kuffner text Beethoven set to music in the Choral Fantasy, while not as lofty as Schiller’s Ode To Joy, radiates a similar optimism about the human condition. The Choral Fantasy is frequently presented on the same program as the Ninth Symphony. It’s a natural pairing, given the works’ creator, musical similarities, and the ready presence of a chorus. On rare occasions, as at this concert, the Choral Fantasy is allowed to stand on its own without the daunting presence of the Ninth. Perhaps it is under such circumstances that the Choral Fantasy can best be appreciated for what it is—an engaging, vibrant, and moving work. The Choral Fantasy opens with an extended improvisatory passage for solo piano (Adagio). There is a brief dialogue between the orchestra and soloist (Finale. Allegro). After some orchestral fanfares, the soloist introduces the principal theme (Meno allegro). The flute begins the first of several variations on the theme involving the soloist and orchestra. A brief transitional passage with cadenza-like flourishes for the soloist serves as a bridge to the entrance of vocal soloists and then the chorus for the triumphant final series of variations (Allegretto, ma non troppo, [quasi Andante con moto. ]).